New Winter 2018: Capture a child at a wonderful age with one of the locket frame ornaments in our collection. 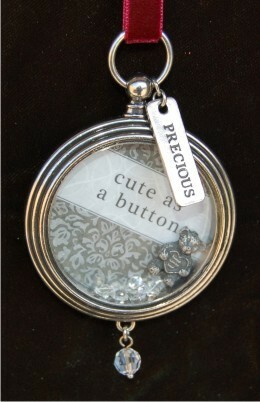 The cute as a button baby locket frame Christmas ornament features a quality pewter locket with glass door, precious metal tag and a sparkling crystal to catch the holiday lights. A plush ribbon is included with these kids ornaments for boys or girls, and grandparents love them too. Whether looking for a baby Christmas ornament or for something for an older child, these frame ornaments are a lovely choice. Put your little guy or gal on display this season to everyone's delight with the pewter round locket frame ornament that ships in our classic velvet gift pouch. Very nice quality Nov 13, 2014 Patricia B.